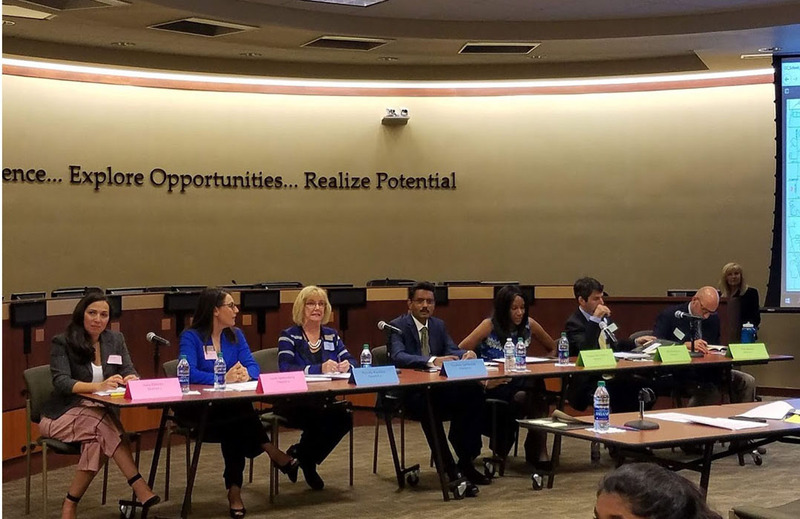 Candidates for Carmel Clay Schools board of trustees answered questions from the Carmel High School PTO and community members at a forum Oct. 24. Candidates had 90 seconds to answer pre-selected questions from the PTO as well as a few from the audience. In District 1, Sara Elitriby is challenging incumbent board President Layla Spanenberg. In District 2, incumbent Pamela Knowles faces a challenge from Venkata Tadikonda. In District 3, Cinnamon Bell-Williams and Eric Morris are challenging incumbent Mike Kerschner. Candidates were asked questions such as how to deal with a shortage of state funds and how best to keep students safe at school. Spanenberg called for greater security and preventative measures. “I want us to continue to work at getting (school resource officers) and school psychologists at each of our schools,” she said. Knowles said that active shooters were not the only safety concern that the school board needs to consider. Although candidates were not specifically asked about the controversial closing of Orchard Park Elementary School, the topic did arise. Morris, a Home Place resident who announced his candidacy days after the vote to close Orchard Park, spoke against the action. “The decision to close that school was premature,” he said. Bell-Williams said that the closing may have damaged the board’s relationship with Home Place. “It’s important that we start to rebuild a collaborative relationship with the Home Place Community and students,” she said. Issues such as school-day structure and the hiring of Dr. Michael Beresford as superintendent were also addressed. Tadikonda seemed open to the idea of keeping current school start times. “The elementary kids are capable of observing and processing information later in the morning, whereas the high school kids need to be ready to be early birds later, in the workplace,” he said. Kerschner said the search for a new superintendent has served as an example of the school district’s strength. “During that search, we saw how strong our district is based on the pool of extremely qualified candidates who applied for the job,” he said. Responses were mixed when candidates were asked whether they would support adding more seats to the school board. Elitriby and Tadikonda said yes. Bell-Williams and Knowles said no. Spanenberg, Kerschner and Morris said that they may consider discussing the matter under certain circumstances.